In our experience, when organizations develop their business strategy there is often too much emphasis placed on realizing goals and not enough emphasis placed on goal setting or developing the right goals. Sometimes strategic goals need to be identified from scratch. Sometimes they need to be shaped from a set of existing values into a coherent vision that can shape and frame policy. Sometimes they need to be held up, one against another, so that the tensions and conflicts between them can be identified and the necessary trade-offs resolved into a coherent strategy. This is what strategy is about. This comes before determining the plans and activities to realize goals. AllChange has developed a sweepingly collaborative approach to vision creation and implementation. It enables groups of executives to collectively explore, build-out, validate, test, and bring-to-life their thinking. This means the right objectives, instructions and metrics are created. It also ensures the necessary levels of alignment, buy-in and ownership are in place. 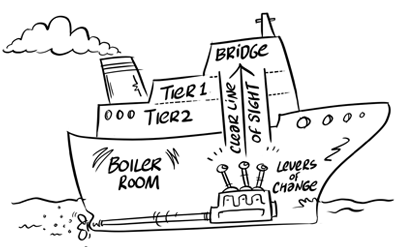 We understand how to create team cohesion and alignment, from the bridge down to the boiler room, with a clear line of sight to the operational levers that drive better performance and deliver the envisaged results. "A vision without a plan is a dream, a plan without a vision is a task. You need both to effectively execute."